At first glance, this category seemed like a no-brainer: the iPhone 5’s stunning industrial design and craftsmanship has certainly no equal. However, the Galaxy S3’s slightly curved rear end feels better to the touch, compared to the iPhone’s stark corners. However, the case for the S3 goes downhill when you pore over its cheap-looking plastic body, versus the iPhone 5’s aluminum construction. As always, you can navigate around the iPhone 5 using one hand even if it’s about half an inch larger than its predecessors. The Galaxy S3, on the other hand, takes a bit of effort to reach those far corners. However, to the naked eye, both screens seem well-matched in terms of brightness and sharpness, even if the iPhone 5 does have a higher pixel density. So basically, it boils down to preference. If you enjoy larger screens for your games and movies, then you’d like the S3’s display. For ease of use with one hand, you can’t go wrong with the iPhone 5. On paper, the iPhone 5’s dual core 1.2GHz CPU and the Galaxy S3’s quad core 1.4GHz seems like a mismatch. In practice, however, the two seemed more evenly matched. When it comes to intensive visuals, you can attribute the iPhone 5’s power to its A6 chip, which is said to have the same performance as the iPad 3. In contrast, the Galaxy S3’s Mali-400MP graphics processing unit also did very well despite using the Android’s customised interface. Much has been talked about in the Android versus iOS war, and yet, there’s no clear winner between the two, despite what each side’s rabid fans may vehemently proclaim. Again, your choice would be based on preference. Android provides a deep customised experience, while the iOS focuses on ease of use and simplicity. The iPhone 5 comes with a sapphire glass lens and back-illuminated sensor that ups the quality significantly when compared with the earlier 4S. But despite these new-fangled upgrades, it’s still a tightly fought category. Both smartphones have 8MP snappers, a panorama mode, and amazing image quality. The tiebreaker here is the panorama mode in iPhone 5, which performs admirably. It’s much easier to use and lets you take even larger images. Despite Apple’s pronouncements of an improved battery life, the iPhone 5 lasts just about an hour or so longer than its predecessor for a total of eight hours under moderate use. It’s not really bad, per se, but it’s no match for the Galaxy S3’s 2,100mAh battery, which can easily last longer 10 to 11 hours. 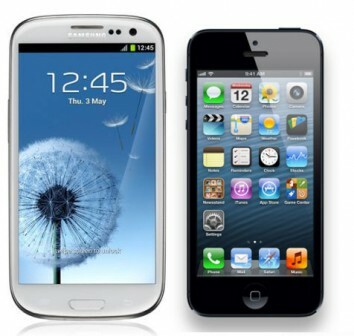 Both the iPhone 5 and Galaxy S3 are available in 16, 32 and 64GB variants. The Galaxy S3 gets the edge though, because you can upgrade its memory with a microSD card of up to 64GB in size. The S3 also has a whopping 50GB of free cloud storage courtesy of Dropbox. The iPhone 5 has its own cloud—the aptly named iCloud, but it only provides 5GB of free memory. We were actually expecting the iPhone 5 to win because it’s the newer phone. The S3 is older by four months, which is forever in smartphone years, but it can surprisingly go toe-to-toe with the iPhone 5. So what does this verdict mean? Since the phones are almost evenly matched, the choice of winner is on you. Since you’re the one who’s buying, would you go for usability or customisation?